The Mechanical and Technical Understanding Test (MTVT) measures mechanical-technical understanding, an aspect of practical intelligence. to provide teachers with information on the practical and technical skills of their students. 1. All 32 multiple-choice items involve practical technical problems that can, in principle, be solved by visual inspection. 2. The items are arranged in ascending order of difficulty. The majority of respondents can tackle – but not solve – all of them within the given time. The MTVT can therefore be classed as a power test. 3. In keeping with its nature as a power test, the time allowed for the MTVT is limited (45 minutes). 4. The MTVT can be administered as an individual or group test. 5. Because of its modest requirements in terms of time and materials, the MTVT is an economical test. 6. The MTVT is an objective test and one that, in comparison with the majority of tests of this type, is highly reliable. 7. There is content- and factor-based evidence of the validity of the MTVT. 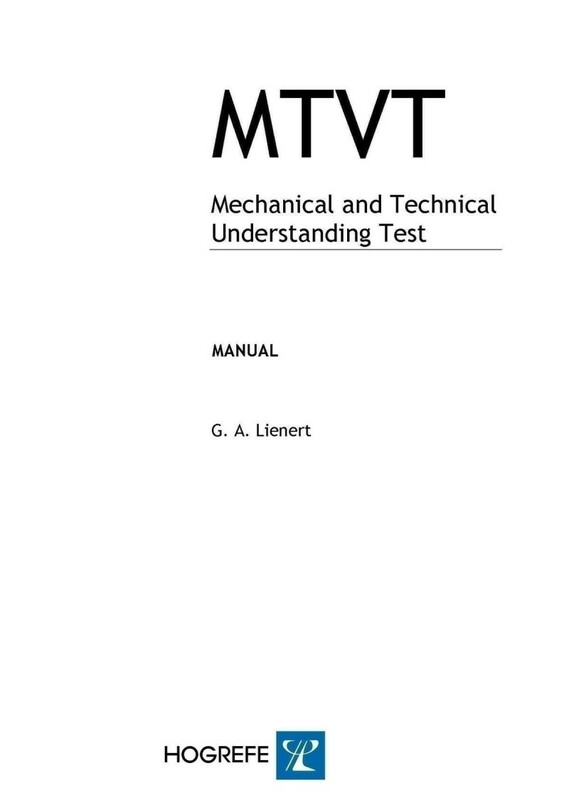 An electronic copy of the MTVT manual is provided with any purchase of the test. The manual is required by those administering and/or interpreting the results of the MTVT. The paper and pencil version of the MTVT was originally published in Germany in 1958. The MTVT is now taken using Hogrefe’s online testing platform, the Hogrefe Testsystem (HTS). Hogrefe has released the new HTS 5 test platform for online administration of the MTVT and other assessments. The new system is a major improvement over the previous HTS 4, offering increased ease of use, new and updated reports, streamlined ordering of tests and a host of additional features and benefits.